WASHINGTON — The U.S. Senate on Tuesday confirmed Dr. Vivek Hallegere Murthy as the next U.S. surgeon general by a vote of 51-43. President Obama nominated Murthy in November 2013. Last October, several members of the Congressional Asian Pacific American Caucus CAPAC sent a letter to Senate Majority Leader Harry Reid and Senate Minority Leader Mitch McConnell, urging them to expedite the confirmation of Murthy. 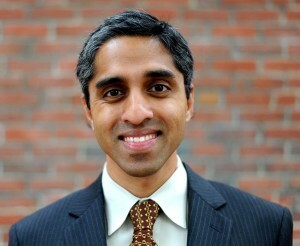 Since 2009, Murthy served as the president and co-founder of Doctors for America. He is also a hospitalist attending physician and an instructor in medicine at Brigham and Women’s Hospital at Harvard Medical School. He received a B.A. from Harvard, an M.B.A. from Yale School of Management, and an M.D. from Yale School of Medicine. McConnell and other Republicans opposed the nomination. The Kentucky senator said in a statement, “The surgeon general is known as America’s doctor and the men and women chosen to fill that role in the past have usually been highly qualified individuals with substantial experience in patient care. Unfortunately, Dr. Murthy’s nomination had more to do with politics – he was a founder in 2008 of a group called Doctors for Obama, and has been an outspoken political advocate of Obamacare and gun control – than his medical experience. Rep. Judy Chu (D-Pasadena), CAPAC Chair: “This confirmation comes at a critical time for our nation as we work to address various public health concerns, including the Ebola epidemic abroad. Dr. Murthy is the first Indian American to hold this position, which is a testament to both his own distinguished career and the great strides made by the Asian American and Pacific Islander community. His experience, talent, and compassion evinces the very characteristics needed in a surgeon general. Rep. Mike Honda (D-San Jose), CAPAC chair emeritus: “The Senate’s confirmation of Vivek Hallegere Murthy as surgeon general is great news for the nation and for the Asian American and Pacific Islander community. His qualifications were never in question — the only delay was because one faction of the Republican Party chose to play politics with America’s health. Dr. Murthy’s confirmation strengthens the AAPI community’s voice and presence, and marks a positive step toward addressing the need for greater diversity in all levels of government. Rep. Joseph Crowley (D-N.Y.), Congressional Caucus on India and Indian Americans co-chair: “I congratulate Dr. Murthy on his confirmation as our nation’s next surgeon general. He is a dedicated fighter for public health, and I know he will work tirelessly to improve the health of all Americans. I was proud to stand with him during his confirmation process, and I look forward to working with him in his new role. Rep. Grace Meng (D-N.Y.): “Although the vote was long overdue and never should have taken this long, I am happy that it finally occurred. I now look forward to him getting to work to address the important health needs of Americans. I am also excited to share this historic moment with the Indian American community. Less than a week after the Senate approved Richard Verma as the first American of Indian descent to serve as ambassador to India, Dr. Murthy was confirmed as the first Indian American to be surgeon general.